Verizon has opened its website for iPhone pre-orders about 10 minutes early. 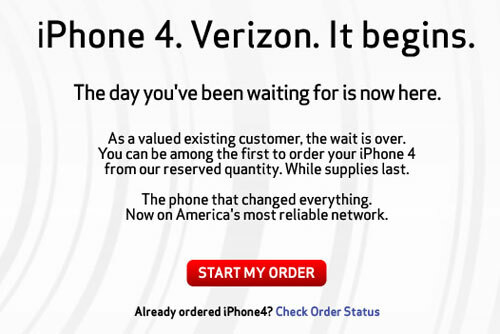 Existing Verizon customers can begin pre-ordering their iPhone 4. Apple's own website is now also accepting preorders. Early reviews for the Verizon iPhone were released late last night. The general conclusions were that Verizon did provide better reception and voice coverage, but data speeds (when there was coverage) were slower than AT&T. The Verizon iPhone also allows customers to set up a mobile Wi-Fi hotspot to share their phone's internet connection to their laptop or iPad. This does require an additional $20/month fee. Orders for new Verizon customers will begin on February 10th. Verizon expects there to be high demand and is asking employees to hold of on ordering an iPhone until the initial demand slows down. Verizon's plans are posted on Apple's site.